YEREVAN. – There had been no rally of such enormity in the Third Republic of Armenia. “My Step” initiative leader, Civil Contract Party member, and National Assembly (NA) “Way Out” (Yelk) Faction head Nikol Pashinyan on Wednesday told the aforesaid to reporters at France Square, in downtown capital city Yerevan. He added that this process is funded by people from Armenia and the Armenian diaspora, and that the respective reports will be presented later. Also, Pashinyan informed that a rally will be held Wednesday at Republic Square at 7pm. But he did not state a deadline for their movement. On Tuesday, Pashinyan and his supporters closed off and marched through several streets in downtown Yerevan. Subsequently, they blocked the buildings of a number of state agencies. In the evening, a rally of thousands of people held at Republic Square at the heart of Yerevan, where Pashinyan presented his plan. Also, he noted that they will form a revolutionary committee that will coordinate all actions, and they will begin the third phase of their actions on Wednesday. On Monday, Police used special means, especially stun grenades, against the demonstrators at Baghramyan Avenue. As a result of these clashes, 46 people—including Pashinyan—were taken to hospital. And on Tuesday, police detained several demonstrators from the streets of Yerevan. According to police, 76 of the 82 people that were detained have been released. 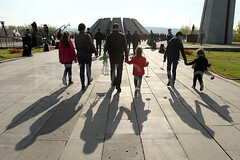 On March 31, the opposition Civil Contract Party, led by Nikol Pashinyan, had started a protest march through several towns of Armenia—and whose objective is to prevent the third term in office by ex-President Serzh Sargsyan; but this time as the next Prime Minister—and which concluded on April 13, with a rally at Liberty Square in downtown Yerevan, and then with a round-the-clock sit-in at France Square. 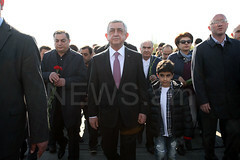 But on Tuesday, the National Assembly elected Serzh Sargsyan as the Prime Minister of Armenia.